Benefits: The lavender essential oil is used like an anti-septic, accelerating the processes of healing wounds, burns and various skin disorders. It is also effective against insects’ bites, sun burns, acne, eczemas, skin inflammations, dermatitis, dandruff and hair loss, fungi and lichen. It might be applied undiluted for wounds healing and anaesthetize. It lowers the arterial blood pressure and stimulates the egestion of liquids by the organism. The lavender oil is extensively used for various respiratory problems including influenza, chills and colds, sore throat, asthma, sinus congestion, bronchitis, laryngitis and tonsillitis, as well as for air disinfection. It has calming and anti-depressive effects, removes nervous tension in cases of mental exhaustion, anxiety, tachycardia, insomnia, and calms down nervous tension and hysterics. Blending: Lavender Essential Oil blends well with with many other essential oils including cedarwood, pine, clary sage and geranium. Application: for massage, baths, compresses, inhalations (aroma lamps), lotions and soaps after consultation with aromatherapist. 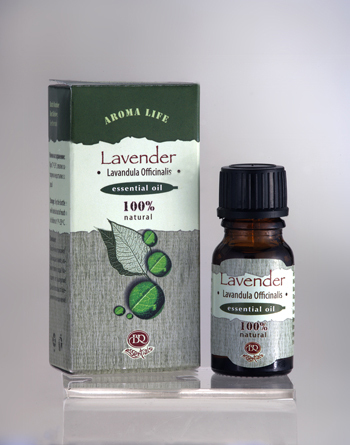 Attention: Counter-indicative for epileptics, hypertonic, breast-feeding mothers, pregnant women, children and people showing individual unbearableness to lavender essential oil, as well as to people with oncological diseases, treated by chemotherapy. To be used very carefully in cases of low blood pressure. People suffering from asthma to avoid the use of lavender essential oil in rooms with abundance of water vapors, because this might cause fits.